Now this looks absolutely delicious. 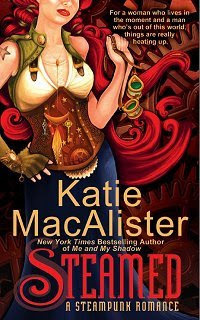 Steamed: A Steampunk Romance comes out next February from paranormal romance writer Katie MacAlister. I for one would like to see more of this sub genre. Visit her website or blog for more information. Jack Fletcher's heart is about to get punked. I like Katie's books! But what is 'steampunk'? Steampunk combines vintage worlds (think the Edwardian era and Sherlock Holmes) with advanced, but kooky, technology. Sometimes magic comes into play. Did you ever see Will Smith's Wild, Wild West? That's steampunk. Cover looks interesting. Never read MacAlister before. Still deciding if Steampunk is the type of books I would enjoy. Caffey Liana hits it pretty good below, also think Jules Verne 20,000 Leagues or Well's Time Machine or the train in Back to the Future 3 or even the moveie The LEague oif Extraordinary Gentlemen. This is great cover art, I've read a little steampuck, mostly graphic novels. I love some of the anime that falls into this category. Oh brilliant, this looks fun! I have not read Katie MacAlister - or a steampunk novel for that matter. :) I'm looking forward to this book. Oh, wow! This one is definitely going in the "to be bought" list. I've read some of Katies books. This seems like a good read. I really like the cover. The only other book Ive seen thats Steampunk is clockwork heart which seems very interesting also. I love Katie MacAlister's other books, but hadn't heard about this one yet. Thanks! Thanks Pissenlit - I fixed it now ! Michelle you should really try her dragon series - it is a lot of fun! Ella it will be interesting to see how Katie handles a Steampunk story. I won't miss this one. KB it is a debut novel too and really wonderful world building. Delitealex Heather at Galzxy Express did a fabulous set of posts on Steampunk - you can check them out here. I just love this cover! It's so unique! Gonna love this one Ladytink.